Griot's Garage and Wolfgang make paint correction effortless! Griot's Garage is an advocate of having fun in your garage and nobody knows paint correction better than Wolfgang which is why we've paired these two together in the Griot's Garage Random Orbital Wolfgang Duo! 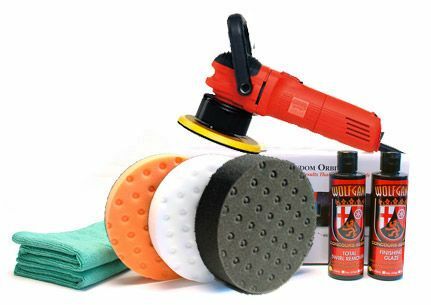 With this money-saving kit you can remove swirls, scratches, oxidation and water spots – restoring the shine and luster to your vehicle's finish. We've carefully selected the correct Lake Country CCS pads to use with each polish so there is no guesswork involved. The Griot's Garage 6 inch Random Orbital Polisher outperforms other dual action polishers because it has a stronger motor capable of producing higher speeds. This buffer operates at 2,500 to 6,800 RPM and has a wider 5/16 inch orbit than its predecessor. The enhanced speed combined with a wider orbit enable the pad to make faster, broader passes over the paint. Imperfections are removed more quickly and completely. The polisher features a powerful 7 amp, 850 watt motor with low-end torque for low speed polishing. A hook and loop backing plate is included. Wolfgang Total Swirl Remover 3.0 is a hybrid of our original Total Swirl Remover formula and Menzerna's fast-cutting polish for ceramic clear coats. It combines Wolfgang's diminishing abrasive technology with Menzerna's special milling process, which produces consistently sized, fast cutting abrasives. Wolfgang Total Swirl Remover 3.0 is an aggressive swirl remover with the gentle touch of a shine-enhancing polish. It's not an oxymoron – it's a unique breed of abrasives that level paint without scratching. Wolfgang Total Swirl Remover 3.0 starts improving the paint immediately and leaves the paint noticeably smoother and shinier, even before the finishing polish is applied. Wolfgang Finishing Glaze 3.0 is a water-based emulsion with ultra fine diminishing abrasives that gently polish the paint to a brilliant gloss. Compounding swirls, mild oxidation, and water spots disappear to reveal glassy smooth, beautiful paint. Underneath a wax or sealant, the paint radiates with energy and gloss. Wolfgang Finishing Glaze 3.0 is gentle enough to use on new OEM paint finishes, yet it is highly effective on hard, ceramic clear coats. Firm, high density foam for scratch and defect removal. Use this pad with polishes and swirl removers. It's an all around pad that will work on most light to moderate imperfections. Less dense foam formula for the application of waxes, micro-fine polishes and sealants. This pad has very light cutting power so its perfect for pre-wax cleaners. 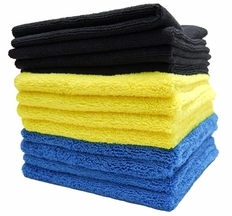 Super soft and absorbent, these 70/30 towels are perfect for buffing off waxes, polishes and sealants. Tiny looped fibers polish the paint to a flawless shine, while the woven core absorbs an incredible amount of liquid. These multi-purpose towels are both safe and effective at removing even the most stubborn wax residues. The durable microfiber construction eliminates the risk of scratching or marring the paint. A total retail value of $244.92. You save 54.93! Griot's Garage 6 Inch Random Orbital Polisher HD! The HD model has a heavy duty 16 gauge, 25 foot power cord hardwired into the polisher. The longer cord is more convenient than an extension cord and it is gauged to deliver maximum power to the polisher for safe, efficient operation. 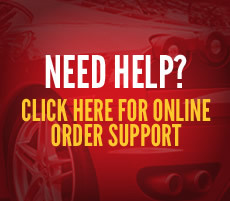 Select the HD model from the drop-down menu below.